When we first began our food storage adventure about 50 years ago I had no clue about the right way to set about doing it. I would buy an extra can of tuna fish or a bag of dried beans as we had the extra money. Back then, my food budget was $12 a week! Now a couple of loaves of bread and a jar of peanut butter cost about $12! Anyway, because my storage knowledge was lacking, I sometimes found a few cans of food that were expired, way expired, in the far corners of my shelves! My intentions were good, but my planning was poor. At that time, even a small financial loss meant a lot to a struggling young couple with rent and college tuition. That is how we learned the importance of implementing an effective rotation system. My husband and I sat down and figured out a plan that would work for us. Your plan may be different but this blueprint will work for just about anyone. Taking the time to make a detailed assessment of what you now have, what and how much you need to add to reach your goal of a month, two months or a full year’s supply of food, will put you on the right track. The final step would be planning and carrying out a simple yet effective food rotation strategy. There are so many storage systems available online that you need only to do a computer search to provide ideas to think about, whether to purchase or to build for yourself. Keep in mind that very long-term foods (20-30 years) like dried beans, certain whole grains, dried onions, potato flakes, dry milk etc., when properly sealed in cans, certain storage buckets or in Mylar bags, should also be figured into your plan in some way that allows your family to become familiar with the taste and texture of these long-term foods. This includes prepackaged meal plans if you plan to use them as part of your overall goal. If you only plan on using these type of foods “down the road” when a crisis comes you may be facing a multifaceted challenge: allergies, refusal to eat them, especially by children, intestinal pains from a radically changed diet or even a lack of knowledge of how to cook these foods so that they are edible and even tasty. One Caution: To avoid making a costly mistake; don’t rush out and purchase a full year’s supply of prepackaged food. Very long-term cans or Mylar sealed foods (20-30 years) have their place and are a wonderful food source to store and rotate however don’t just take a friends or colleague’s word for it that a particular long-term food is excellent. It may be wonderful for them but will your family like it? Don’t believe everything a company tells you about the product. Especially about the servings per can as they may be smaller than required for providing the needed daily caloric intake as we have talked about on BDS already. Check the ingredients and additives since some cause adverse reactions in certain people. The safest thing to do would be to search out all of your preferences and then purchase one can or a sampling of different products to discover what your family likes. Doing this will also give the cook an opportunity to experiment with possible ways to prepare, enhance and combine long term food products. I have known of several over-enthusiastic preppers who have rushed out and purchased several thousands of dollars’ worth of dehydrated and/or freeze dried food and they were sorry that they had not researched it more and sampled it before that large expenditure was made. Incorporate long-term foods into your current meal plan, even if it is only occasionally so that when things get tough, eating new and perhaps strange textured foods doesn’t add to the already increased stress levels. Okay, suppose you are a family of five. Make out a complete seven-day menu that your family actually likes. Keep in mind that your health is affected by the foods you consume. If you feel your current meal plan needs any adjustment it is a good idea to try any new dishes on your family before stocking up on foods that might be rejected when they are most needed. Cooking with some food storage ingredients such as dehydrated or freeze dried foods isn’t difficult, but it is a little different than cooking with fresh or canned ingredients. Before you make a major purchase of food for rotating through your food storage, try out different recipes that can help you make home-cooked meals so delicious that your family would never guess they’re from food storage. You can do a 2-week menu plan to add more variety if you’d prefer. For a week (or two) keep a record of what is eaten, breakfast, lunch, dinner, and snacks. Be detailed, including exactly how much is consumed, including fresh foods. Yes, this is a bit of work but it can pay large dividends in the long run and could actually save your life. You get the point; then multiply those numbers by 52. This is just the beginning. It can be daunting but if done in a methodical way can be accomplished with good planning and family cooperation. Eg: I make sure to have on hand 105-pint jars of canned chicken breasts and thighs. That number ensures that we can use about 2-pint jars per week. It makes quick easy salads, chicken gravy or sandwiches. I sometimes use a can of this home canned chicken in Brunswick stew during the cold late autumn days and winter months. There are so many uses for the same product. After creating this list of foods your family eats, sit down together and tweak the list. This is an important step because depending on the season of the year the list would change. You usually won’t be having hot cocoa in July or lemonade in January. Tweaking the list as a family has the added benefit of getting teens or even slightly younger kids on board! Their opinions are important in planning for any emergency, disaster, shortage, or adversity. Since you know your family, you will know best how to achieve their cooperation and physical assistance. Be upbeat and make it fun. Adding steadily to your food storage as your budget allows will set you on the right track to get it done. After you have reached your goal, don’t let this food sit on the shelf as you will lose it. Rotate it, use it and as you use it replace it in “rotation” newest on the back of the shelf. I usually can chicken, beef or venison meat every three to four months so that I keep our level never lower than an 8-9 months’ supply in rotating storage. Take the time to date each item before storing it away. If you have your food storage on a continual rotation system, you are unlikely to experience spoilage and waste. When there is a sale, check the dates to make sure the store isn’t using a “short sale” (nearly expired date). If the dates are good then this is a chance to stock up, but only if this item is something in your menu plan or something that your family loves to eat. NOTE: factoring in some food treats and surprises can help to lighten up tense or stressful times. We used to keep a detailed list of when we used up a can and when we replaced it. Somehow, that went the way of the dodo bird and is now extinct. But for those longer term (20-30 years), stored out-of-the-way foods, it is essential to keep a close track because they are usually used up more slowly and it can be quite easy to forget to replenish that stock. Store your food in a cool (70° or lower), dry, dark place—like a basement. Use a dehumidifier if needed. Never store anything, especially cans on a cement floor. They will be more prone to rust. There are four factors that contribute to how long your food storage items will last: light, temperature, moisture, and oxygen. The less interaction your food has with these four things, the longer it will last. Use food-grade plastic containers to store food. If you plan to dehydrate, can, or store your own food, use containers made of ceramic, glass, or stainless steel. Non-food-grade plastic containers can leach chemicals into your food so they are not suitable for using long-term. Use the proper oxygen absorbers in cans and Mylar bags. There is more to an effective rotation and there are other methods that you may be using that work well for you. The above is just one example and could include more detail but perhaps this small sampling will inspire some thought about where you are with your self-reliant food storage goals. If there is another way to tackle your food storage plan please share it with us. It might be just the system another reader is looking for! Cansolidators: Part of our shelving is ”cansolidators” shown below. They are adjustable and easy to use. They come unassembled. Connecting the pieces securely take a little muscle but we’ve used them for about ten years, and they are sturdy and continue to serve the purpose of easy rotation. We waited for a sale and got them for 50% off. I think they go on sale twice a year. They are stackable and can be configured to fit a variety of can sizes and can be used by sitting them onto sturdy shelving or the smaller ones can fit into kitchen cupboards. Using either option makes organization of canned foods more accessible and it’s easier to keep track of your supply as they rotate the older cans first. There are cupboard and pantry versions and their depths are different so make sure you are ordering the right one for your needs. Yes, these do take up space on your shelves but for me it is much easier and more convenient to be able to go right to the consolidator and reach for the oldest can and see the next can in line roll down the angled shelf, than it is to root through stacked cans on a regular shelf. It all depends on what you want to accomplish: space or rotating accessibility. One full shelf containing 14 to 16-ounce cans holds 10 cans (see the green peas) and the smaller configured shelf on the left holds 20 cans of tuna sized cans. I’ve never had a problem of sagging or buckling. If anything the weight seems to stabilize the unit. If you are looking for a large complete rotating system there are several online options but you can also find great DIY options and blueprints giving detailed instructions including material lists. Using creativity, the options are endless and customizable to any space you have available, large or tiny. So if you are handy with wood or metal, get creative! Food Rotation Systems, sometimes referred to as Can Rotating Shelves or Canned Rotating Racks are available in different sizes. They are designed to easily store and rotate a large number of cans. Many systems are adjustable and can accommodate small soup cans to #10 cans. All rotating systems that I have seen are “first can in, first can out” known as FIFO. There are free standing options in various sizes but use Caution. If you have climbing children, this freestanding unit could seriously injure a child! There are units made to fit flush against an existing wall. Bolting all units to the studs should be done since these filled units can weight 100’s of pounds. These units can be pricey but watch out for significant sales throughout the year. DIY racks can be customized to your needs completely. This rack below can hold 112 cans plus it has two side panels for smaller tuna cans stacked sideways. For safety, it should be bolted to the studs in the wall. For my money, this appears to be a very space saving, durable option and much less expensive than the commercially available systems where you can easily spend over a thousand dollars! I just think of how much food storage could be purchased for that money. You can’t eat shelving so if you can do the DIY or have a friend or family member who is handy, for my money that’s a better option. This link shows great another DIY option. This one could be placed in the back of a closet where there is often unused space plus it has the added benefit of being somewhat hidden from view. Build your own food storage shelf that slides into the wasted space between your refrigerator and wall. There are shelves on wheels that slide between your washer and dryer. They are meant to hold laundry supplies but also work well as a food storage cart. Choose a room in your house and look around to discover if there is an area suitable for storage. Think unconventionally. There are under the bed plastic boxes on wheels and since they are fairly shallow all of the contents could be easily viewed when pulled out from the bed. While not as durable as heavy plastic, metal or wood systems, these cardboard systems are actually fairly nice because they’re, easy to assemble, inexpensive, and you can add more of them as your needs increase. They aren’t adjustable. I have a friend whose husband saw these cardboard systems and made several of them out of plywood in a variety of sizes then he created a wall shelf mount. In one area, he secured a vertical row of these that were double sized and mounted them in a small otherwise wasted vertical space between two existing cabinet shelving units. In my canning classes, meat preservation is a favorite request and those classes are always well attended. I was surprised at the number of newly married young women who want to learn what they think of as “old-fashioned” skills. I’m encouraged that this home art is definitely making a comeback. But finding appropriate storage space can be a challenge, especially for apartment dwellers. Making benches out of number ten cans, bricks and plywood with a decorative quilt or blanket on top works quite nicely for those just starting their storage journey. We have a friend who found a unique solution. She was fortunate enough to find a couple of large medical file cabinets in perfect condition for $15 each. Each of the five drawers holds 95 pints of canned produce! They are now bolted to the wall for safety. These are great at keeping out the light; a good plus for long-term storage and glass jars. So keep an eye out at yard sales and estate auctions this summer and you may discover a file cabinet or other unique storage unit. There are options available on Amazon but be careful to read the reviews. I checked some out but most were not the greatest. The cost was cheap but so was the quality. Flimsy was a word often used in reviews. That said, I didn’t check all of them so you may find one you love and that works for your purposes. Use them to create bookcases/shelving to hold more cans by laying a wooden board across four cans (two on each end) and stacking more cans and boards until your shelf is the size you’d like. Use larger bins, such as Super Pails or totes as end tables or coffee tables. Simply disguise it as furniture by covering them with tablecloths. Stack them behind your couch where there is wasted space between the couch and wall. Fill the dead space in your coat closet. Typically there is quite a bit of vertical space underneath your coats in the closet. It’s a great, accessible place to store your food. Don’t be like I was when first considering food storage, with little knowledge and then just plunging ahead. Taking the time to Plan, Store, Organize and Rotate has made all the difference in having a successful experience and feeling the peace that my family and others have that cushion of food preparedness. Keeping perspective in a changing society can help us focus on what really matters. When the grocery shelves are empty, whether it is from a snowstorm, trucker’s strike, civil unrest, economic crisis or job loss we still need to eat. A well-planned food storage system can allow you and your family the time needed to get through a crisis. Not every crisis is of the “end of the world” variety; in fact, most of them are not. So good planning and gradual but steady advancement to your goal of 1 month, 3 months, 6 months or even a year’s worth of food will provide some security and peace of mind for you when you are facing a challenge. Neither FEMA nor any other governmental agency is prepared to take care of you. If you believe that they are, and you are depending on that just take a glance back at any of the recent weather events and think of the chaos during Rita or Katrina. People were affected not just at the storm center of the hurricane but for a hundred or more miles around the perimeter. Good people were hiding in their homes. Police were waiting to help but their hands were tied. The need for preparation is abundantly clear. There are many areas of preparation in our lives. The great blessing of being prepared is that it gives us more freedom from fear. Are you just beginning? Do you have a plan yet? Are you experienced in food storage? Please share the successes and failures you’ve had wherever you are in your own storage journey so that we can learn from each other. I like your plan for regularly using your stored foods, many of which are foods you cooked and canned yourself, which are usually delicious. I’ve tried samples of dried foods from several prepped food storage companies, and they were all mostly just sauces that a person would have to add fresh vegetables and/or meat to. You can’t expect to live on mostly a bunch of sauces with almost no solid foods in them. It would be rather horrible to find that out during a disaster, so using everything on a rotation of oldest 1st is a good idea so you actually know your whole food store will actually work for you. I would like to encourage you to add another method to try out. Foods you cook and can yourself are usually way more delicious than commercially canned foods and without various preservatives and chemicals and GMO foods that are bad for the health that are in commercially canned foods. P.S., the word prepper got changed to prepped by Google in my 1st paragraph. Also, I believe they say the freeze dried meals or foods are supposed to last up to 20 years, as DRY storage, (not frozen storage). Freeze dried prepared foods on the ISS are expected to last 6 months, but they actually last much longer, and they may have up to a 2 year extra supply in case of emergency. Oh I wish a company would give me a freeze drier to “test”. But even the cheapest good one is about $2000 plus substantial shipping, then a couple of add-ons. A dear friend purchased one about a year ago and has produced some tasty meals with it. The company is now in the process of building a new model that doesn’t need to have the oil changed, in fact,the new one won’t even use oil. But the cost is over $3000. My fear is that since it is computerized and there is a glitch I may have to send it back to the company (which is across the country). So I wait for the time the freeze driers settle down in price! I do a lot of dehydrating with my Excalibur dehydrator in the meantime. As to your youtube video suggestion. I wish I had the time to do it but alas, sigh, I am already over extended, like most folks. If you are interested in more food storage ideas there is a wonderful woman named Wendy Dewitt. She may have some video’s that would be of interest to you, and others. I am so glad that you felt the article was worth while. Hoping it inspired some new food storage goals and rotation plans! Thanks for taking the time to make comments. It gives me feedback and encouragement! Love these suggestions. Here’s another – twice a year I do a “no grocery shopping”month. Once in January which is the middle of our winter and again in the June, whic his the middle of our summer. All meals are made soley from things in our pantry & frezer. It’s been really intersted to see, in a no-buy time period, which foods we gravitate to and which are still in the pantry untouched at the end of the month. I’ve learned, for example, that none of us particularly likes canned tuna but we didn’t mind the flavor of canned chili or canned chicken. This no-buy period gives me a much better sense of what to stock more of, less of, and none of. What a great idea Jill! Thanks sharing your experiment of only going to you “home store” for meals. That would be true eye-opener and learning tool. Great for creating a personalized family food plan for practical use…less waste and fewer surprises if food is needed for a longer term real emergency. We’ve done something similar with electricity. These kinds of “what-if” scenerios’ reveal gaps that need to be addressed. Thank youso much for taking the time to share your family’s experience. As I always say, “we learn from one another”. This is something I’m not very good at and need to improve on. Mio, Believe me I know what you’re talking about. It was difficult for me to get into a workable rotation groove. But I will say that once you finally figure out what works, you’ll wonder why you didn’t do it earlier. I hope there were a few ideas in the article that either inspired you or sparked an idea that will work and make the process easier for you. Start with the first baby step! Happy Planning and Rotating! I love your suggestions for expanding storage space by using organizers. My free-standing pantry is deep, making it difficult to reach anything in the back. Also, making use of “dead” space. Isn’t it interesting just how much unused space is available in our homes or apartments of we really look for it with a new perspective? I know what you mean about your deep pantry. We have one and I used a couple of those white plastic coated wire risers in the back. Those make it easier to see what I have back there plus utilizes the upper empty space. However I still must use a stepping stool to reach the back of that pantry. I’m happy you found the article helpful! Thanks for reading and taking the time to share a comment. I have only recently begun reading on the subject of food storage and rotation. Great article , very informative. Thank you. I congratulate you for taking that first step! Glad you liked the article. There are so many resources available and Backdoor Survival is a good place to start. Very helpful article! I love the “cansolidators” also. It’s great that they are adjustable to accept different sizes of cans. I have had good success stacking two sets of cansolidators atop each other and placing them on “Ivar” wooden shelving units from IKEA. Those wooden shelves are height-adjustable so they can fit perfectly above and below the stacked cansolidator units! 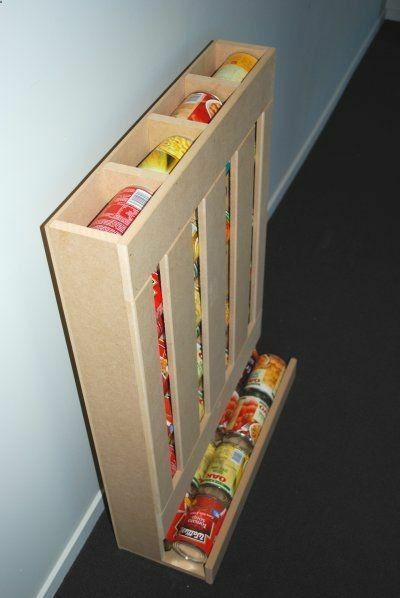 The DIY wall rack depicted in your article also looks like a great, economical way to store canned goods.